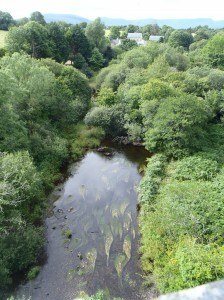 View from the viaduct at Durrow Bridge, Co. Waterford of potential mammal habitats provided by the River Tay and surrounding woodland and scrub, photo by Simon Barron. In 2013 BEC Consultants, in conjunction with Blackthorn Ecology, prepared a GIS map of mammal corridors for County Waterford. This work was carried out in support of the Mammals in a Sustainable Environment (MISE) project, which is funded under the INTERREG Programme IV and involves counties in the southeast and east of Ireland, as well as western Wales. The MISE project in Ireland involves monitoring different mammals including otters, pine marten, bats and squirrels. The GIS map created for the project was prepared by collating all available spatial datasets that held habitat data for the county. Datasets were first assessed for accuracy and reliability using a combination of aerial photograph interpretation, ground truthing and expert knowledge of the datasets. Through this, a reliability hierarchy was developed. Prior to amalgamation, datasets were cleaned and any topographical errors were remedied. The datasets were then iteratively combined, based on the reliability hierarchy, and any overlaps were removed, to produce a single GIS dataset of habitats for the county. The permeability of the landscape for mammals was investigated and presented graphically by assigning a suitability code to every habitat polygon for each of the four mammal groups. This was based on the habitat type and the species’ ecology and habitat preferences. Specific surveys were also carried out for the project to obtain up-to-date information on habitats in some of Waterford’s wetland sites, MISE survey areas and proposed Natural Heritage Areas to complement the existing datasets. O’Neill, F.H., Barron, S.J., Smith, G.F. & Brophy, J.T. (2013) A preliminary habitat corridor map for Co. Waterford. A report submitted to Waterford County Council, Waterford.